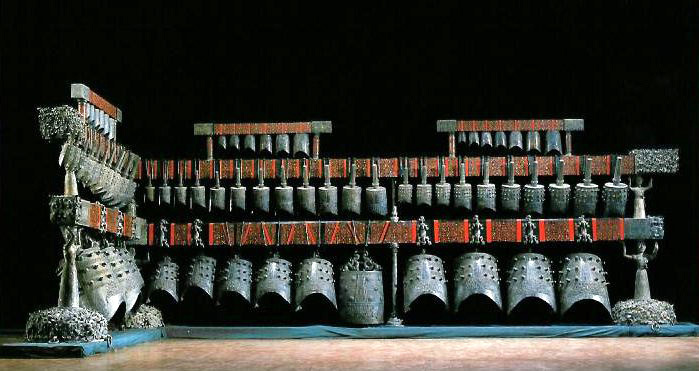 Dating from the 5th century B.C.E., the tomb of Marquis Yi of Zeng in Suizhou, Hubei, furnished some of China’s oldest musical instruments and earliest reliable musicological writings. The instruments in the smaller chamber containing the Marquis’s coffin—two mouth organs, one small frame drum, three se, and one five-stringed and one ten-stringed instrument—suggest a more intimate chamber genre such as that depicted in a 5th-century tomb in Shaoxing, Zhejiang. These two genres may correspond to the “old” music of the Zhou court (ca. 1050–256 B.C.) that Confucius preferred, and the “new” music of the surrounding states that he felt had a corrupting influence. This according to “Different tunes, different strings: Court and chamber music in ancient China” by Jenny F. So (Orientations XXI/5 [May 2000] pp. 26–34). Above, replicas of the bells; below, a performance on the bell replicas and those of other instruments from the tomb.